In this earliest known recording of William S. Hart's voice, the actor (and by now, Newhall resident) recites an abbreviated version of his original poem, "Pinto Ben." Published in a book in 1919 ("Pinto Ben and other stories" by William S. Hart and his sister, Mary Hart)  and as sheet music, and recited on this Victor record, and recited on the radio  "Pinto Ben" is the story of a pony that gives up his own life to save his master from cattle that are set to stampeding by some foolhardy city men. This recitation was recorded Oct. 18, 1928, in Camden, New Jersey, by the Victor Talking Machine Co. (which was based in Camden). It was the "B" side of Victor record No. 9297. 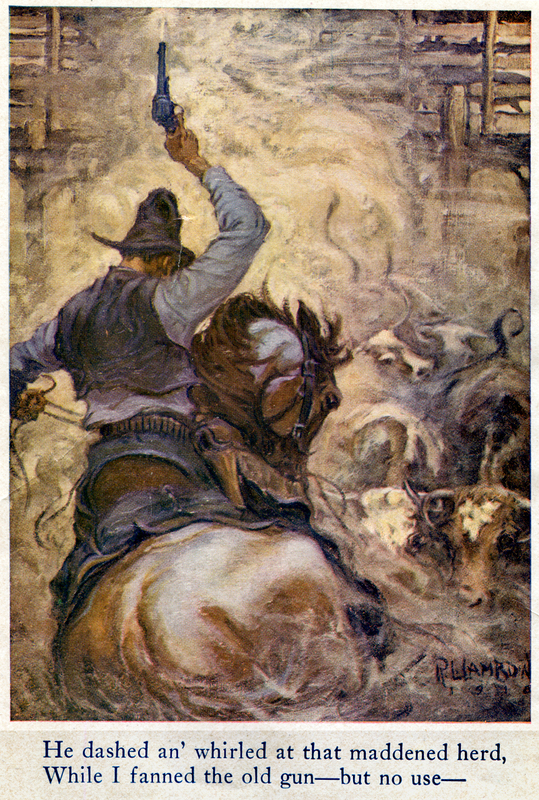 On the "A" side, Hart recites the poem "Lasca," written in 1882 by Frank Desprez (misspelled Depres), a onetime theatrical writer who emigrated from Bristol, England, in 1877 at age 24 and took up cowboying in Texas. "Lasca" is essentially the same story as "Pinto Ben." According to a letter dated June 1, 1929, Hart received $267.13 in royalties from the Victor Talking Machine Company as payment in full under a contract dated October 16, 1928, based on 3,562 units sold through April 30, 1929. Victor No. 9297 was Hart's only Victor sound recording, but he would recite "Pinto Ben" again  the full version this time  on his friend Rudy Vallee's "Fleischmann Hour" radio show on NBC on Dec. 13, 1934. His next known voice recording was his 8-minute monologue for the 1939 re-release of his 1925 film, "Tumbleweeds." The full text of "Pinto Ben" follows, as published in his 1919 book. 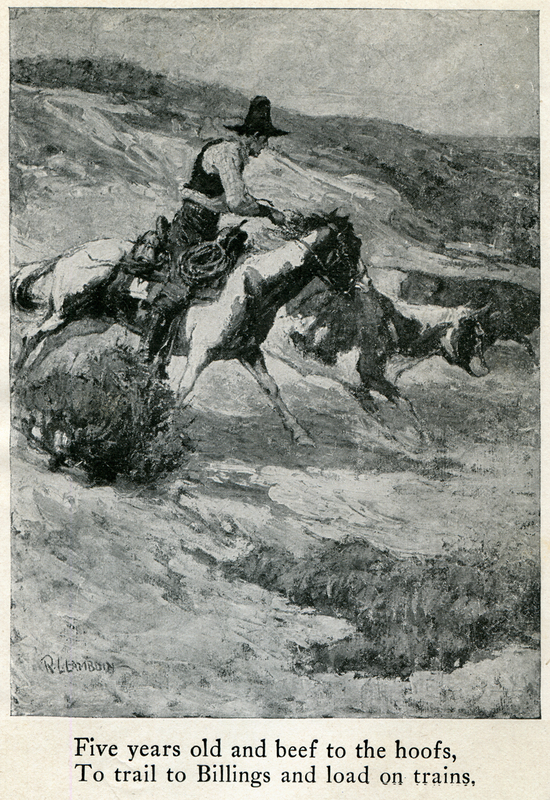 Illustration by Robert Lynn Lambdin in Bill and Mary Hart's 1919 book, "Pinto Ben  and other stories." Lambdin (1886-1981) was primarily a magazine and calendar illustrator in the 1920s and 1930s. "Pinto Ben  and other stories"
An' that pink-nosed Pinto know'd me. To trail to Billings an' load on trains. Ever hear of the Chinook outfits? That's us; Big Dry  N Bar N.
Yet the pride of the wrangler's string. If they run on the rope all day. Till to the saddle-tree I got fast. With them eyes as big as a plate. Illustration by Robert Lynn Lambdin. See above. Say son  you should seen us pullin' our freight. An' Ben wus a King  work or play. Where we would be sure to go broke. Wus what wus sent with the bunch. An' it sure wus hard on Ben. From them there Chicago stock yards. If they'd watched them cattle grow? "You're done  when they're in the big pen." Glared them frightened an' blood-shot eyes. Why didn't we tear out their throats? From a herd o' mountain goats. Right at the back o' the herd. Straight into that chute ravine! Just a simple cow-pony, Ben. Or quirt a-burnin' his flank. Blind fury an' hell all turned loose. Four lengths!  it wus sure our death ride. God! What's that out in front? A gate,  iron bound  rearin' high! An' I know'd he'd make it or die. If another look from Ben I could find. A-listenin' to his last sigh. An' that we must soon hit the back trail. An' tried to stand,  an' died. So long, Ben  all in a day's work! So long  you Son of a Gun. LW2341: Digitized 2013 by David Veal from original Victor record; record acquired circa 2006 by Leon Worden.